NCDA OIC Zubiaga delivering an inspirational message. 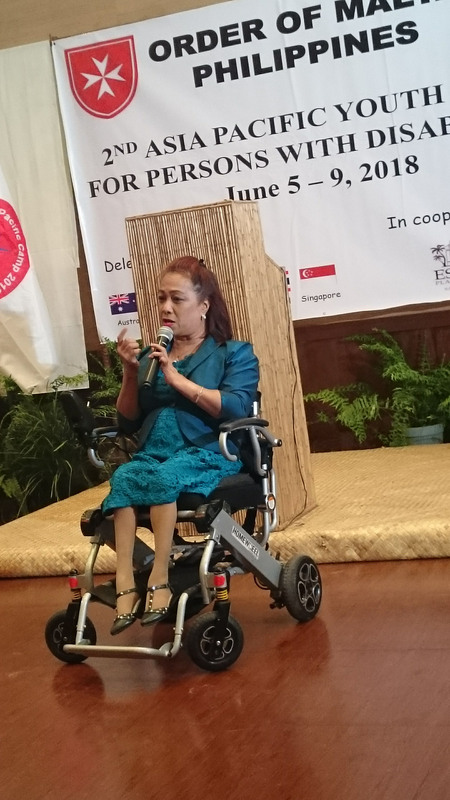 The National Council on Disability Affairs (NCDA) Officer-in-Charge, Ms. Carmen R. Zubiaga serves as the Inspirational Speaker during the Opening Ceremonies of the “2nd Asia Pacific Youth Camp for Persons with Disabilities” held on June 6, 2018 at the Villa Escudero in Tiaong, Quezon Province. The event, which was participated by representatives from Australia, Hong Kong, Philippines, Thailand and Singapore, was organized by the “Order of Malta Philippines”, a humanitarian organization which conducts spiritual/religious and hospitaller activities. It was led by its President, Dr. Leopoldo H. Lazatin, Grand Cross of Magistral Grace. In her talk, OIC Zubiaga shares to the participants her struggle as a person with disability from school days during her childhood, involvement in community work, employment in a local government unit until her appointment in her present post at NCDA. Conference participants were inspired how Ms. Zubiaga triumphantly succeeded from her challenges due to discrimination in school and even in her family. OIC Zubiaga also acknowledged how Tahanang Walang Hagdanan developed her skills and fulfilled her mission in life. She was glad to be able to impart to the sector of persons with disabilities who are nowadays acknowledged as partner in nation building, have access to health, education, employment, transportation and even able to raise their own family. She also cited that oftentimes, the inaccessibility of the environment causes the disability of a person. OIC Zubiaga also congratulated the “Order of Malta Philippines” for mounting the event to showcase the talents of youth with disabilities through the different activities lined up for the event. The latter, in turn, awarded a Plaque of Appreciation to OIC Zubiaga for participating in this special event.